PULLMAN – The nights were long and the minutes were heavy last season as Malachi Flynn waded through his first year as a starting point guard in the Pac-12 Conference. So it was no surprise when, toward the end of his rookie campaign, Flynn ran himself right into the proverbial “freshman wall.” At the same stage of his sophomore season, Flynn looks ready to bust through one for the Cougars. Case in point: midway through the second half of a tight game against red-hot Oregon Thursday night at Beasley Coliseum, Ernie Kent called his floor general to the bench for a substitution. Flynn responded with his own gesture, waving the coach off. “I’m OK, I’ll stay,” he insisted. Taking Flynn for his word was perhaps the easiest coaching decision Kent made all evening. Flynn continued his late-season tear with 28 points, Robert Franks added 19 and Viont’e Daniels chipped in 13 as the Cougars willed their way to a 78-76 win over Dana Altman’s Ducks in front of 2,592 fans in Pullman. If there’s any blockade awaiting Flynn this season, he’s yet to find it. In the last three home games, the Tacoma native and Bellarmine Prep grad has scored 78 points, hitting at least 20 in each. Additionally, Flynn’s averaged 21.6 points over the last five games. He was a presence on the glass for the Cougars, collecting a game-high eight rebounds. He was their top distributor with a game-high five assists. His four steals? Indeed, those also were a game-high. Flynn’s torrid play, not surprisingly, has coincided with the best stretch of the Pac-12 season for WSU. Winners of three of their last five games, the Cougars (12-17, 4-13) have now secured the No. 11 seed at next week’s conference tournament in Las Vegas and will play the Pac-12’s No. 6 seed at 8:30 p.m. Wednesday at T-Mobile Arena. A rubber match with the Ducks, who toasted the Cougars 84-57 in Eugene three weeks ago, is possible if not probable. 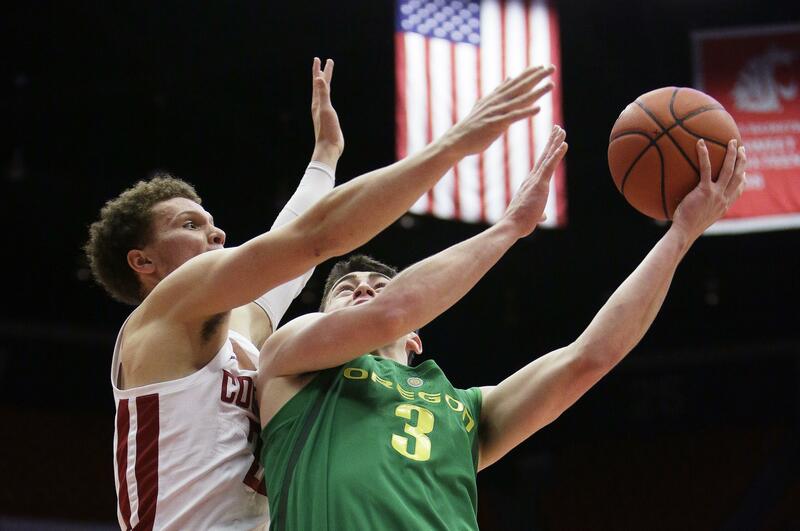 Oregon sat in sixth place prior to Thursday’s game on the Palouse. A three-minute scoring drought in the first half allowed Oregon to rip off a 15-0 run and the Ducks led by as many as nine points before Franks went on a personal 6-0 run to bring the visitor’s lead back down to three. Flynn squeezed eight points into the final eight minutes of the half and the Cougars went into the break leading 37-35. WSU stretched the lead out to 10 points in the second half before Oregon finally offered some resistance. The Ducks, fresh off an upset of Pac-12 top dog Arizona, used a 13-2 flurry to grab a onee-point advantage with 3:50 left. The lead changed three more times before WSU went up two possessions when Flynn intercepted an errant Oregon passed and pushed the ball ahead to Franks, who converted a layup to make it 74-70. Troy Brown’s layup cut the WSU lead back down to two points, but the Cougars successfully navigated the Ducks’ full-court press and Viont’e Daniels swished a corner 3-pointer. UO’s Elijah Brown followed with a triple, but after Franks’ missed jumper, Payton Pritchard had a chance at the free throw line to tie the game, but converted just one of two. After Flynn made it a two-point margin with a free throw at the other end, Pritchard came up short on his last-ditch heave at the buzzer. The Brown duo – Elijah and Troy – led Oregon, scoring 18 and 17 points respectively. Pritchard had 16 more for the Ducks (19-11, 9-8), who possibly blew their chances at earning an at-large bid to the NCAA Tournament with Thursday’s loss. Published: March 1, 2018, 10:41 p.m. Updated: March 1, 2018, 10:42 p.m.